Waterproof thermometers - These digital T-shaped waterproof thermometers offer IP66 - IP67 protection. The waterproof thermometers are housed in a robust polycarbonate case and incorporate a probe that is ideal for heavy duty food processing and catering applications. The thermometers measure temperature over the range of -49.9 to 149.9°C with a 0.1°C resolution. 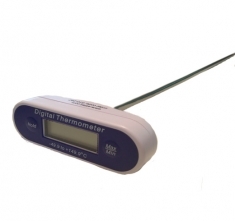 Each thermometer features a 10 minute auto power off facility, maximising battery life. The probe measures Ø5 x 300 mm with a reduced tip (Ø3.5 x 20 mm) to improve response time.